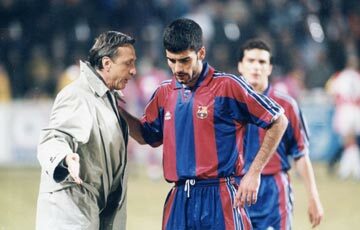 ▲ Football philosophy of FC Barcelona: Johan Cruyff. 1. To think only of attacking football rather than defense-oriented tactics. Attack is the best way. 2. Position change and compact Football (narrow gap between the player) are the basis of total football. 3. If done correctly, a total football techniques and positioning capability are essential. Physical is the next problem. Using the direct combinations is most important in the positioning and techniques. 4. Precise positioning does not commit mistakes and it is much easier if player has a highly technique. 5. Nowadays, football players are consumed a lot of Stamina. A lot of strikers, they needlessly play. 6. Leadership experience is more important than a theory. I am directed by Michel (founder of Total Football) under the 10 years that I’ve learned is the greatest asset. Experience is 95%. There are a lots theoretical leaders without experiencing. 7. If you emphasize only team play, you make to losing of individual creativity and ability. 8. Under pressing football also, if you have the proper positioning and techniques, you can escape from stress and are ready to draw the opponent’s stamina. Being pressured is due to the lack of technique. If you had the ability to advance in a great position, and if the pressure on his leaving, you can defeat defenders. – Great players have a look around first and hold the proper position. The position will make the ball easy to receive. First make good stance to receive the ball and control elaborately the ball. There is a planet free of space and time. – Typically Zidane and Romario, They are not in the press. Around a pre-determined, and is able to precisely control the ball. 9. Youth leaders should improve positioning and technique of youth. 10. If you have an emphasis on physical, I would not have grown into global players. Until the age of 17, I will not be flying around in the corner with the goal weak. But at the time of emphasis on positioning and technique, coaches make me playing. 11. Each player needs a football-specific training and qualifications not to beg for the textbook theory. Positioning and technique are not raised by book. If you want to reinforce the team by scout, it needs the player’s technical level and the positioning to implement the philosophy of Barcelona Football. 13. If a boy is good at dribbling, you need to raise his qualities than to emphasize pass. In higher level, his dribbling gets stuck in a class and then can teach the pass way to him. 14. Just techniques do not mean the circus and high juggling. Techniques are required to play football efficiently. 15. The leaders emphasized the theory cannot becomes good leaders. Due to the football intelligence, experience, football players can be a real good leader. 16. The technique level of modern football is downing. One of the reasons is that kids do not play football at just street. – A growing number of techniques depend on a lot of street soccer and unpredict creativity in matches.